What does Harm. mean in the picture above? Harm. 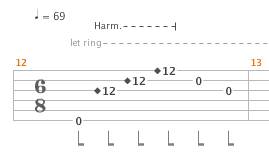 Just means to play the harmonics at that fret. The diamond is also the same instruction of playing harmonics at the 12th fret. The 12 feet has very strong harmonics that are the same note as the string played on, just at higher octaves. Harmonics in general also have a very distinct tone. Not the answer you're looking for? Browse other questions tagged guitar tablature or ask your own question. What is B II, followed by a dashed line, and what does it mean?